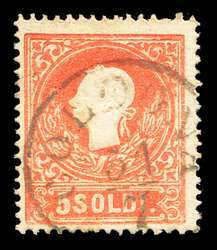 Scott #4, 1850 15c red, Type III Coat of Arms. 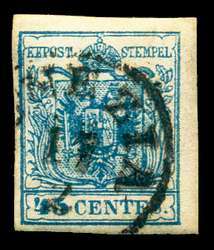 Used VF with nice cancel. 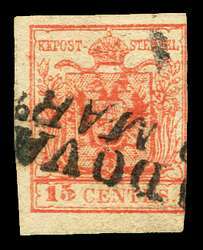 Scott #4, 1850 15c red, Type III Coat of Arms. Used VF. 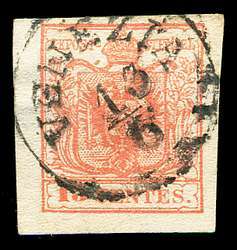 Scott #4f, 1850 15c red, Type II Coat of Arms. Used F-VF. 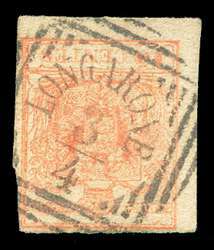 LONGARONE cancel. In 1963 a landslide into a dam above the town of Longarone caused the destruction of the town and killed about 2000 people. 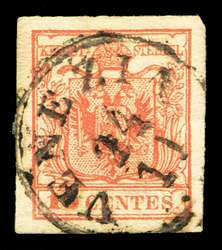 Scott #4f, 1850 15c red, Type II Coat of Arms. Used Fine. 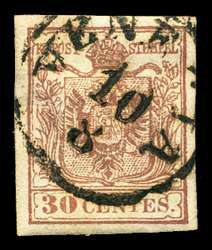 Scott #5, 1850 30c brown, Type III Coat of Arms. Used VF. 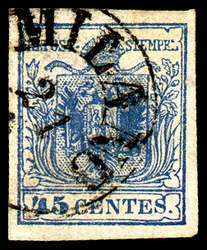 Scott #6, 1850 45c blue, type III Coat of Arms. Used VF. 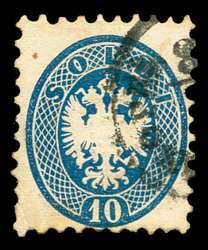 Scott #10, 1858 5s red, Type II Emperor Franz Josef. Used F-VF. COLDONA or GOLDONA cancel. Scott #23, Used VF with small faults.